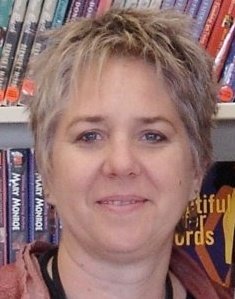 Amy Cheney has won two National awards for her work, I Love My Librarian award from the Carnegie Institution and New York Times and was honored at the White House with a National Arts and Humanities Youth Program Award. She has over 20 years experience with outreach, program design and creation to serve the underserved, serving preschoolers in childcare, middle school non- readers with tutoring program and booktalks, adult literacy students, adult inmates in county and federal facilities, students in juvenile halls, non-traditional library users and people of color. She was named a Mover and Shaker by Library Journal. She founded In the Margins booklist and award. She is currently the District Library Manager for Oakland Unified School District, advocating for 86 school libraries and librarians. For over 25 years Amy has established libraries with culturally relevant books, world class authors and innovative programs throughout Northern California, in the most unlikely places, from Headstart preschool centers to prisons. Amy’s passion is transforming the reality that California ranks 50th in terms of overall literacy development. Utilizing the model she created at the Alameda County Juvenile Hall, the Juvenile Justice Literacy Project creates future invested citizens who read widely and deeply, have empathy, and think critically about information as she provides an information network based on proven success for teachers and librarians serving K-12. • I Love My Librarian! My name is Marilyn Barnes, and I am writing you because I just released a book entitled “From Crack to College and Vice Versa”. It is my life story. Please go to the webpage fromcrack2college.com to learn more about the book. There are many powerful messages in the book, and I feel it may be one that you might want to read because it can be helpful to many other females (young and old) who are involved in the criminal justice system. Amy, I love what you are doing with these young people! I am a teacher in the Bay Area, and I work with struggling teens as well. I’m sure some have crossed your path. My second YA novel is coming out in the next week from Logos Publishing House. It’s called “Birds on a Wire” and follows three days of three boys who are on the verge of becoming men. The book explores their friendships and the idea of “men”. I think it offers young men the chance to discuss their own ideas of love in this hard world. You can visit my website: thisgirlclimbstrees.weebly.com. good luck with your book, ellen. the new cover is fantastic!! Thanks, Amy! Both covers are by Tim Sunderman. He’s awesome! Hey, Amy, I love everything that you do to help kids. I wrote a book entitled, One for the Murphys (Penguin, 2012) for ages ten and up. It’s about a street smart girl who is dropped into a foster home where she learns about a side of life she didn’t know existed – a happy one. It is a story of resilience and I have been told that reluctant readers take to it. If you email me at lyndamullalyhunt (at) gmail (dot) com with a mailing address, I will mail you a couple of signed copies for the kids. Wow thanks for all of your hard work Amy, this website is a great resource, and look forward to hearing from you! Hey Amy I just realized you mentioned having my books on your shelves in an old SLJ issue. Is there a way I can help your kids?